Last Thursday, September 19, H.S.H. 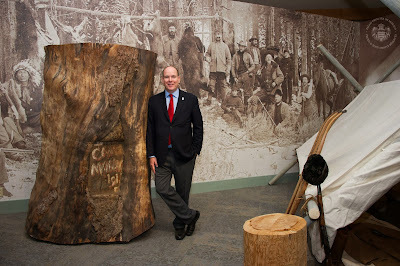 Prince Albert II of Monaco was in Cody, Wyoming, to celebrate the centenary of the visit of his great-great grandfather Prince Albert I. His predecessor on the Monegasque throne had visited the area in his time, guided by "Buffalo Bill" Cody himself (as you read about here last year when this visit was first announced). Today's Sovereign Prince presented the first prize to two American scientists, Arthur Middleton and Joe Riis in recognition of their work. The award was named the 'Camp Monaco Prize' in honor of the previous expedition of Prince Albert I in which their hunting camp was named "Camp Monaco". As you can see in the photo above, that name was carved on a nearby tree and that portion of the tree has been preserved in honor of the occasion when a Prince of Monaco first came to the wild west state of Wyoming in 1913.